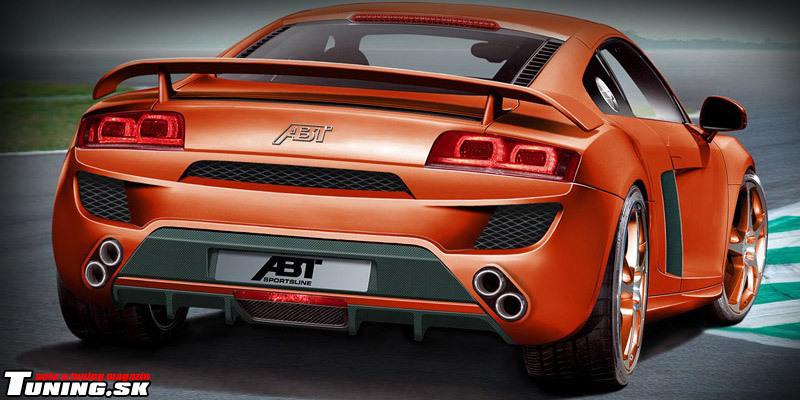 ABT Sportsline Audi R8 – one really EXTRAvagant sportscar! A competition between car manufacturers is so big, that that their first priority is to build the most advanced four-wheel machines. It’s true, that every manufacturer is good in something different – one is focused on supersports, another produces perfect family cars. The car manufacturer called Audi is well known. The racing champion and pioneer of all-wheel-drive Quattro has introduced something that takes breath away despite of it wasn’t a surprise. Their goal isn’t to become something as Ferrari or Lamborghini, but many people compare the German master with these Italian legends. This all thanks to the long awaiting supersport with its shark design called Audi R8. And usually, the tuning world doesn’t hesitate and especially in this case. One of the biggest German tuners ABT Sportsline proudly introduces its new beast. The Audi R8 is a result of longtime work of Ingolstadt‘s designers, developers and technicians. One say that the Audi R8 is a symbol of history and powerful experience (not only from dirty tracks) of Audi, second one thinks that this is a new way of automotive industry. Both are right. Audi and this model is a part of the best automotive production. Maybe it’s not so powerful as Lamborghini, or Ferrari, but it has definitely place between them. This sporting roadster with the aluminum chassis (just only 210kg) and LED daylights has become a hit of the year. Sharp lines, sporting look and perfect aerodynamics are priorities of this German monster. The car has carbon elements both outside and inside, giant openings outside; amazing interior and extreme width prove its sporting hearth. The engine above the rear axle is the biggest lure of this model. A donor of the engine is the most sporting version of the A4 series called Audi RS4. But it’s more agile thanks to the Audi R8’s lower weight. The engine placed under the vision glass is a 4.2 liter V8 with a FSI direct injection. It can produce 420 hp at 7800 rpm. Speeding is easy and providing by 430 Nm of giant torque. These parameters allow the car to reach 100 km/h in 4.6 seconds and 300 km/h without any electronic limits. Many tuners are trying to modify those vehicles that look perfect also in their stock version. But some of them can produce very nice modifications that look even better than those stocks. And one of these companies is today’s ABT Sportsline. This bodykit called Extravagant isn’t some coincidence. It was created to celebrate the 110th anniversary of ABT Sportsline. This long era is a strong proof that also small company can become powerful. So this product has to be more than perfect. The tuner has focused on visual improvements of this beautiful machine. So it has prepared a visual kit including both bumpers, side sills and rear wing. The front part has dominating front bumper with rib opening modified to have only one pair of ribs. Also air openings are covered with a honeycomb black grill. There are tow pairs of spoilers in the front placed under the bumper with a diffuser between them. It’s available also in a carbon variation. The side sills are visible on the car’s sides. Their fine rounded lines are very pleasing. They’re visually lowering the ride and bring some nice amount of extravagance. There is also another tiny change – a pair of vertical openings for air intake to the engine. The Audi R8’s rear part was heavily modified. The biggest change is the rear bumper with three new skewed openings. One of them is situated under the trunk including a big badge of ABT. It’s used as an off take for hot air from the engine area and remaining two openings are for hot air from brakes. They’re connected with an elegant rounded line. We can find there also a big diffuser (carbon version available) coordinating air under the car. There are also interesting exhaust tips placed in the bumper’s corners. The best possible aerodynamics is provided by the sporting wing on the trunk. ABT Sportsline did some nice job under the hood too. They’ve modified the V8’s ECU and installed a mechanical compressor to increase the power for 110hp and 120NM. So now we have the tuned Audi R8 offering 530hp and 550Nm of torque. This means 3.9 seconds to beat the 100 km/h and top speed of 317 km/h. The higher performance needs the best suspension too – new ABT shock-absorbers, bigger and durable 380 mm brake discs and highlight in case of new rims – beautiful 5-spoke doubled rims (9x20 in front and 11x20 at the back). They have same color as the body and wears ultra low-profile tires. How do you like the modification of Audi R8 ABT Sportsline?